We specialise in mini earthmoving, excavation & landscaping services. Servicing Highvale, Brisbane, North Brisbane, Milton, Newstead, Fortitude Valley, Teneriffe, Spring Hill & surrounding suburbs. Call us now! Sams Mini Earthmovers is a family operated business with over 15 years owner/operator experience in earthmoving in Brisbane and the surrounding areas. Sams Mini Earthmovers have the skills and the machinery to bring your project to life. Our state of the art equipment efficiently and quickly transforms your property or project, and prepares sites for landscaping, land development, post hole digging, driveways, pool digging and any other earthmoving requirements. Other equipment and machines are also available on request. Whether you are a developer, builder, landscaper, farmer or home owner Sams Mini Earthmovers is here to help you. 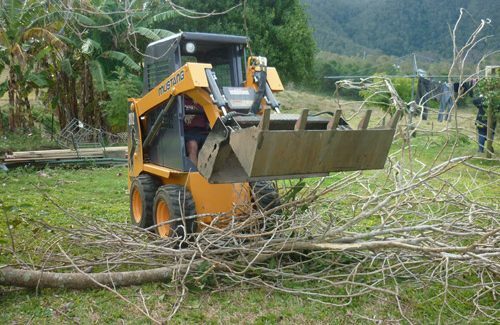 If you are looking for mini Bobcat hire in Brisbane your search ends with us. Our reliable fleet of earthmoving equipment, highly qualified and skilled operators are here to help you with your excavator hire needs in Brisbane and the surrounding areas. Call us today on 0427 198 013. Sams Mini Earthmovers offers a comprehensive range of solutions in areas such as Land Development, Landscaping, Construction, and Irrigation works among others. Our team of experienced professionals provide exclusive earthmoving services in Brisbane and the surrounding areas. Your needs are our priority and we customise earthwork solutions to fulfil your requirements. With state of the art machinery and our experienced personnel, we handle all kinds of post hole digging, drilling and maintenance tasks. Sams Mini Earthmovers also undertake complex landscaping projects, rock wall construction, land development, pathways and rock breaker jobs in Brisbane and the surrounding areas. We offer timely solutions for your earthwork needs.Our operators have all the necessary know-how to handle such situations. Sams Mini Earthmovers offers quality work at competitive rates. Contact us today on 0427-198-013. Sams Mini Earthmovers offer solutions for your earthmoving needs. With quality equipment and qualified operators we can assist with your bobcat, excavation and earthmoving requirements. Sams Mini Earthmovers have the tools and equipment to complete any earthworks including but not limited to - narrow access works, post-hole boring, trenching, site clean-up, and turf preparations. Our equipment is reliable and well maintained. Sams Mini Earthmovers have continually performed quality earthmoving work and have created a niche in earthwork solutions. No job is too big or too small, for the best hourly rates in the South East, call us or fill out the simple online form for a prompt response. Copyright © 2016 Sam's Mini Earthmovers . All Rights Reserved.